So, I’ll be doing a series of posts to give you a peek at what’s changing. 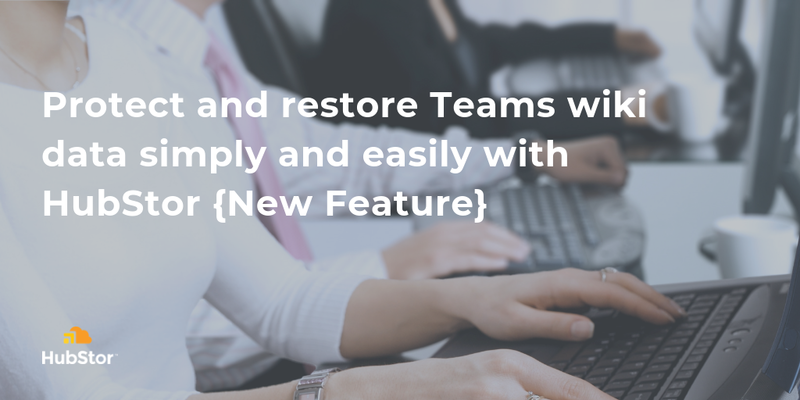 We’ll start with our new support for backup and recovery of Teams wikis. Microsoft Teams is gaining momentum fast due to the demand for full-featured collaboration tools. However, data protection and data management must not have been in the development plan as there’s no user-friendly—let alone administrator-friendly—way to restore a Teams wiki. Restoring a Teams wiki that was deleted accidentally is a bit of a mess and a risk. The bottom line is that the Teams Wiki Data document library you see in SharePoint Online for each Team site contains a read-only copy of the data that’s not suitable for recovery. We suspect Microsoft creates this copy in SharePoint so the content is subject to data governance, such as retention and holds. As an IT professional, you know that you need a solid data protection strategy before encouraging your user community to adopt a new collaboration service. Users will inevitably delete content – accidentally and on purpose and not always with intent to harm. But malicious deletion is still a concern. Data loss can happen to a wiki page, wiki section, a Teams channel, a chat, etc. Protect with point-in-time version capture – HubStor performs incremental backups, capturing point-in-time versions of your Teams wiki data. Enjoy user-friendly display names – Instead of “19:<guid>@thread.skype_wiki “, HubStor will display wikis like this: “[Team Wiki] ChannelName,” making it easier to identify the correct wiki in a recovery workflow. The recognizable name is also beneficial in HubStor workflows like discovery search and data management policies. Preserve embedded images – If you export a Teams wiki page from the SharePoint document library copy, you’ll notice embedded images are missing. HubStor preserves full data integrity so restoring to Teams or exporting to an external file path both maintain the embedded images of your wikis. Recover at any level – HubStor provides the ability to restore individual wiki pages, sections, or the entire wiki. If you restore an entire section or wiki, HubStor will detect the missing pieces and fill in the gaps. In other words, no duplication is created. Incremental recovery is supported. Recover to the original or an alternate Teams site – You have the flexibility to recover your wiki data to the original Teams channel or another channel of your choosing. Export externally – HubStor also supports simple export of Teams wikis to a file path or Azure Blob Storage account for other purposes. If you want to learn more about HubStor’s Office 365 backup capabilities, download this ESG Solution Showcase, and you can get in touch with us for a discussion and demo.